An 89-year-old woman presented to her primary care physician with nonspecific symptoms, including weight loss, fatigue, and mild back pain. Occasional “itchiness” and skin irritation were becoming more frequent and particularly bothersome. Blood tests revealed elevated liver function tests, notably bilirubin (conjugated and total) and alkaline phosphatase. Relevant history included mild to moderate cardiovascular disease and smoking over the course of several decades. A contrast-enhanced CT scan of the abdomen was performed, followed by MR cholangiopancreatography (MRCP). Contrast-enhanced CT scan of the abdomen demonstrated dilatation of the common bile duct (CBD) up to 2.1 cm, with an abrupt cutoff at the level of the pancreatic head. Biliary dilatation extended cephalad, involving much of the central bile ducts. There was enlargement of the pancreatic head, which contained an ill-defined region of relative hypoattenuation. The pancreatic body and tail were not visualized compatible with marked fatty atrophy. 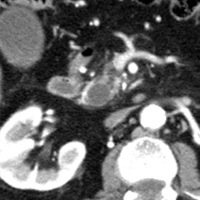 A few scattered para-aortic nodes were present, with most less than 1 cm in short axis. No vascular encasement, vessel in-growth, or hepatic lesions were identified. 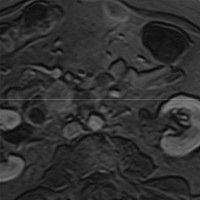 MRI demonstrated a relatively hypoenhancing poorly defined mass surrounded by scant enhancing parenchyma. 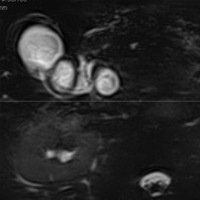 T2-weighted MR cholangiographic images vividly displayed biliary dilatation. 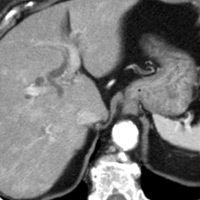 CT is often the primary imaging study and, in the majority of cases, sufficient to verify the presence of a mass, determine the level/degree of obstruction, and assess specific variables that are surgically relevant—namely, degree of vascular encasement, nodal metastasis, and/or distant metastatic disease. 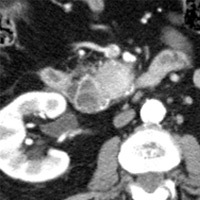 Pancreatic adenocarcinoma is a hypovascular tumor, generally appearing as a hypoattenuating mass on contrast-enhanced CT, particularly during the arterial phase. Dedicated pancreatic protocols are designed to enhance lesion visualization and characterization. Exact margins of the tumor can be difficult to discern, and measurements of tumor size are often imprecise. 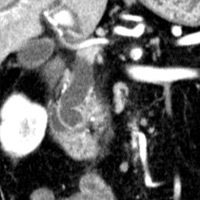 Some tumors may be isodense to pancreatic parenchyma precluding CT localization or just too small to characterize. In such cases, findings such as the double-duct sign, with abrupt termination of the CBD and/or marked atrophy of the body/tail, are fairly specific. Di Magno EP, Reber HA, Tempero MA. AGA technical review on the epidemiology, diagnosis, and treatment of pancreatic ductal adenocarcinoma. American Gastroenterological Association. Gastroenterol. 1999;117(6):1464-1484. Karlson BM, Ekbom A, Lindgren PG, Kallskog V, Rastad J. Abdominal US for diagnosis of pancreatic tumor: Prospective cohort analysis. Radiology. 1999;213(1):107-111. Manoharan P, Sheridan MB. Neoplasms of the pancreas. Imaging. 2004;16(4):323-337. O’Malley ME, Boland GW, Wood BJ, Fernandez-del Castillo C, Warshaw AL, Mueller PR. 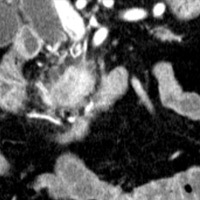 Adenocarcinoma of the head of the pancreas: Determination of surgical unresectability with thin-section pancreatic-phase helical CT. Am J Roentgenol. 1999;173(6):1513-1518.
van Gulik TM, Moojen TM, van Geenen R, Rauws EA, Obertop H, Gouma DJ. Differential diagnosis of focal pancreatitis and pancreatic cancer. Ann Oncol. 1999;10(Suppl 4):85-88.